There has been an enduring debate in the wind industry about the merits of pitch versus stall regulation. These alternatives were discussed in the earlier section The Technical Challenge of a Unique Technology. 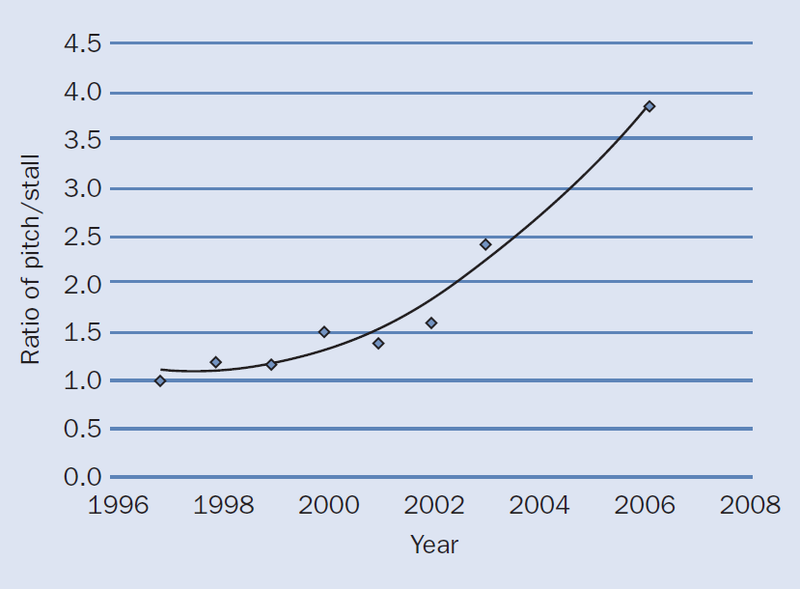 Until the advent of MW-scale wind turbines in the mid-1990s, stall regulation predominated, but pitch regulation is now the favoured option for the largest machines (Figure 3.22). There are now about four times as many pitch-regulated turbine designs on the market than stall-regulated versions. The dominance of pitch-regulated turbines will be still greater in terms of numbers of machines installed. The prevalence of pitch regulation is due to a combination of factors. Overall costs are quite similar for each design type, but pitch regulation offers potentially better output power quality (this has been perhaps the most significant factor in the German market), and pitch regulation with independent operation of each pitch actuator allows the rotor to be regarded as two independent braking systems for certification purposes. There has been some concern about stall induced vibrations (vibrations which occur as the blade enters stall) being particularly problematic for the largest machines. However, there has in fact been little evidence of these vibrations occurring on a large scale. There were specific problems of edgewise vibrations of stall regulated rotor blades (or in the nacelle, tuned to the edgewise rotor whirling modes experienced by the nacelle), associated with loss of aerodynamic damping in deep stall, but this was addressed by introducing dampers in the rotor blades.